Del Webb Trinity Falls will be the newest neighborhood in McKinney's Trinity Falls master-planned community. 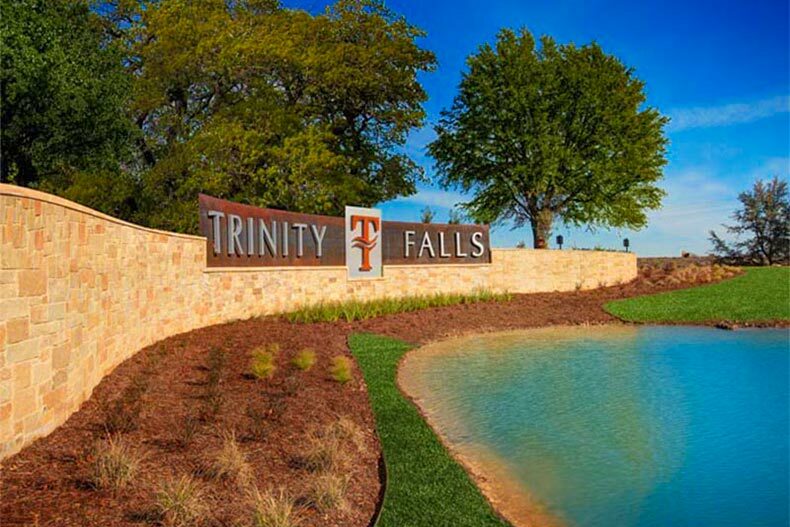 Active adult homebuyers who want to live in a vibrant, new 55+ community in Dallas-Fort Worth can explore the brand new Del Webb at Trinity Falls. Situated inside the master-planned Trinity Falls community, this 55+ community in McKinney gives active adults resort-style living along with low-maintenance, single-family homes. Upon completion, this community will contain 537 homes spread across 127 acres. Active adults who have fallen in love with the Del Webb brand can soon get a peek at model homes within Del Webb at Trinity Falls. This summer, Del Webb plans to open six model homes along with an on-site information center. Homes are expected to priced from the mid $200s to the low $400s. Homes in this age-restricted community will range in size from 1,306 to 2,605 square feet and provide homeowners with two or three bedrooms, two to three bathrooms, and attached two-car garages. Many homes will feature luxurious open floor plans with central kitchens, guest suites, and sunlit morning rooms. Active adult homebuyers can also explore floor plans that provide breakfast nooks, oversized pantries, and sizeable covered back patios that are ideal for summer cookouts and relaxing with friends. Living in Del Webb at Trinity Falls means enjoying a fun and enriching way of life. Active adults can pursue their favorite hobbies, explore new interests, and get to know their neighbors in this vibrant community. Del Webb at Trinity Falls will boast its own 12-acre amenity area with a 10,000 square-foot clubhouse, fitness center, and courts for pickleball and bocce. Active adults can also enjoy the resort-style swimming pool, which is designed with lap lanes and lounging areas plus a hot tub. Residents of Del Webb at Trinity Falls will also have plenty of opportunities to enjoy the great outdoors and take advantage of the pleasant Texas climate. At The Club, the clubhouse for all Trinity Falls residents, residents can mingle with neighbors at a social room that opens to a sunset terrace or gather with friends in the open-air pavilion that features an oversized fireplace. There’s even an amphitheater overlooking a lake, providing the perfect setting for memorable nights. Residents gain private access to the neighborhood’s age-restricted amenities in addition to all the amenities located in Trinity Falls. When the grandkids come to visit, homeowners can take them for a day of fun at the beach-entry swimming pool, which features a kid’s splash area, or head to the disc golf course for a lively game. Outdoor enthusiasts will relish the 20 miles of hiking and biking trails that wind through the community’s picturesque wooded areas and scenic creek landscapes. Altogether, Trinity Falls offers more than 450 acres of open spaces, including neighborhood parks, playscapes, and a dog park that borders the trail system. Active adults who enjoy spending time on the water will appreciate the canoe and kayak launch that Trinity Falls plans to develop. Every day presents an opportunity for active adults to stay socially, mentally, and physically active. Del Webb at Trinity Falls plans to bring on a full-time lifestyle coordinator to plan and oversee a variety of clubs and events. Neighbors can meet up at the clubhouse, which serves as the community’s central hub for hobbies and activities. Whether homeowners want to spice up their cooking skills, learn to line dance, or refine their computer skills, they can find an event or activity to suit their desire. Nestled on the banks of the East Fork of the Trinity River, residents of Del Webb at Trinity Falls are within easy reach of all the Metroplex has to offer. Dallas is just a 45-minute drive away while Fort Worth is just an hour away. Active adults who desire big-city amenities but want to reside outside the hustle and bustle of the city will enjoy life in Del Webb at Trinity Falls. Homeowners don’t have to travel far for daily conveniences and entertainment. The community is near several restaurants, pharmacies, and grocery stores, putting everything active adults need within easy reach. Notable restaurants such as Cadillac Pizza Pub and Hutchins BBQ pack some local flavor, and when active adults want to enjoy a night out, they can head to Cinemark Movies, Main Event Entertainment, or Strikz Entertainment, which are all nearby. Residents can also enjoy peace of mind knowing that Del Webb at Trinity Falls is close to several world-class medical centers, including Baylor Scott & White Hospital, Methodist McKinney Hospital, and McKinney Medical Center. Active adults interested in new Texas homes for sale will find an enticing selection of new homes and top-tier amenities in the new age-restricted community of Del Webb at Trinity Falls.